In June 2012 and over 3 weeks over 5000 Australian fans logged on and voted for their favourite Elvis Presley songs. The votes have been tallied, the CDs manufactured and fans will be able to pick up their copy of Elvis By Request from Thursday, 16th August. An American Trilogy is the #1 most voted Elvis song by Australian fans. Released in 1972, Elvis performed it regularly in his live concert tours and was included in the 1972 documentary Elvis On Tour and the internationally broadcast concert Elvis : Aloha From Hawaii. Whilst it was never a hit at the time of release it seems clear time has made it a favourite amongst fans. Elvis By Request is released on the 35th anniversary of Elvis' passing and is a fitting tribute by fans to The King of Rock 'N' Roll. Overall not a bad selection at all. Each of us may have an idea about certain songs, but it represents the whole legacy up to a more than agreeable selection. Yes, it's a good list. I don't totally agree with all the selections, but in total, good. However, I'm with Steve V ref. Heartbreak Hotel, it was a mega hit ! Even non-Elvis people around the world know this song. WOW!! The diversiy in the Elvis fan world is enormous. Only 4 or 5 of those songs would be CONTENDERS for my top 40, though they are all great songs. I would have had I Just Can't Help Believin, Johnny B Goode, Dirty Dirty Feelin, Pocket full of rainbows, Doncha think its time, I gotta thing about ya baby, Way down, trouble (68 version), Hawaiian wedding song and who knows what else. Perhaps for the 80th birthday they might consider to give fans the option of custom made albums where fans could send in their own personal choice tracklisting, but with a standard artwork and packaging. I bit expensive perhaps.... By the way, does anyone know if the Concert from this years Elvis Week will be released on DVD? The 25th annivesary concert DVD was good, but I thought it was spoiled by the commentary. I would prefer just a straight concert. This is just the good compilation. A great difference between "The Dutch Collection", ann"i am an Elvis fan'. This is the real way. very different then the other two. The tv ad is very ordinary... a nice opening line where Elvis says hello to his Australian fans but after that all we get are about 5 still photos and not one after 1956... when 80% of the album is post 1960 and the man can move the way he does why wouldn't you use a video and make it more representative of the content... gee, I'd love to make an Elvis ad! I understand, but if I am reading this right, the songs are in the order they were voted. The ground breaking Heartbreak Hotel last? Judy, I Miss You (#8 !! ), Wooden Heart, etc ahead of it? Amazing. But Steve V, the Aussies are like you and me, Heartbreak Hotel is our abiding Memory Of Elvis, that's how folks wanna remember him especially on the forthcoming August 16th. Well, the version of 'Amazing Grace' from, 'He Touched Me', cannot compare with Elvis singing the blues into the same song on the outtake, one of his best and last blues vocals.. This is a good compilation. Well done Aussie!!!! Some of the choices baffle me totally. I guess it will do well in Austrailia since the fans voted for these, but talk about a CD that has no flow, going from ALLC to Amazing Grace and ending with H Hotel? Would people really enjoy this CD? It's a hard listen for me. I'd rather make my own CD as would most other people. Yes indeed a fine cd with beautiful cover and amazing how few of the 50's classics made it on here. I think the criticism of 'I'm an Elvis Fan' is justified, like did they really pick the Aloha version of Suspicious Minds over the tantalizing, hypnotic live 1969, 'Elvis in Person' version. Are they mad are what? Maybe i'm wrong. Anyway the memories come flooding back for August 16th, The night The King went down, i'm ready for the big day tomorrow, my son and i are having an Elvis themed menu, homemade cheeseburgers with a nice salad and not forgetting fried banana and peanut butter sandwiches for desert, 'Seriously'. Plus i finally picked up the 'Elvis '56' dvd, as narrated by Levon Helm. So looking forward to remembering The King in style. A sad day but gonna celebrate it. It's Elvis Day, one of the big dates on the yearly calender. I'm fully aware that every fan has his/her own favourite songs. That's one reason Elvis was so great. He had such a vast and diverse catalogue that it's hard to choose just a handful in a list like this. Frankly, I'm surprised with some of the choices above, such as "I Miss You" (No. 8 ??!! ), "Teddy Bear" and "Wooden Heart" (too childish imo), "Blue Hawaii" and "Hawaiian Wedding Song" (too syrupy) and "Amazing Grace" (there are much better religious songs). Even "Judy". although it actually is a fave of mine, was a surprise choice. But not having at least one song from the SUN period is nothing short of criminal, for me personally anyway. Having said all that I must admit this is by far better than the US release "I Am An Elvis Fan". I like the Australian song list, better, than the American song list. It's a better variety of Elvis' whole career. Unfortunately in America, RCA-Sony, had the fans choose from a short list of songs that were pre-selected. I wish, the record company, would have let, the fans, write in (choose) at random, any 20 songs from Elvis large catalog of music, and not, just a few preselected ones, to choose from ! Why would the Record company let the fans choose the "live version" of "Burning Love" but, not the studio (single) version? But, for some reason, they do let the fans choose a studio and a Live version of "Suspicious Minds"? And then to make things worse, you can't see the fans faces in the mosiac Album cover, so the fans have to buy the larger poster, from a website, to see themselves on the album cover. The Record company should have supplied a "fold out poster" in the CD package, for the fans to enjoy and see themselves. It could have been so much better ! And of note, the song levels, vary on this CD. The levels, should be at the same level, all the way through this CD. But its not ! So the flow of the CD, is ruined ! "American Trilogy" (from "Aloha") for example, is very Low in sound, compared to some of the other tracks, on the CD. Does anyone at RCA-SONY, play the CD, after its remastered, and make sure that, its of best quality? The booklet in the CD, is a highlight, however. I look forward to the next RCA release "Prince from another Planet" but, as with all the releases, there will be a few mistakes too, I'm sure of it !! 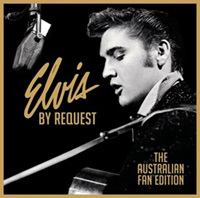 Well the 5000 Aussie fans that logged on have done themselves proud and the final 2cd product is indeed a nice selection of Elvis songs and really hope it sells well.Almost forgot to mention that the cover also is outstanding and for me a lot better that the mosaic type cover from a previous release.....just my own opinion. now thats a mixed bag and a far better release than the recent i'm an elvis fan cd. imagine amazing grace right after allc jxl mix!